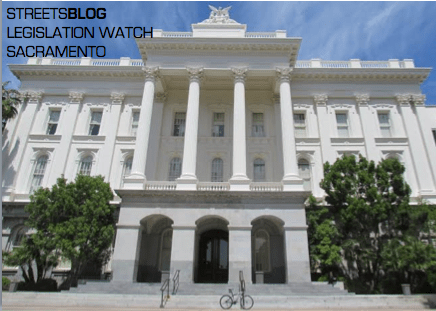 The California Legislature saw a lot of action in the last two weeks on bills related to sustainable transportation. The deadline to pass bills out of committee was on the Friday before Memorial Day weekend, and today is the deadline for all bills to be voted on by their houses of origin. If they couldn’t pass by today from the Senate to the Assembly, or vice versa, then they died for this session. Below are the fates of some of the bills Streetsblog has been following. There are a few other relevant bills that don’t appear here because they have already passed from their house of origin, including S.B. 1151, which would raise fines for traffic violations in school zones, and A.B. 1193, which would require Caltrans to institute standards for protected bike lanes. A driver’s license is still more important than the safety of bicycle riders and pedestrians: A.B. 2398, Marc Levine’s (D-San Rafael) Vulnerable User Law, passed out of the Assembly Appropriations Committee last week, but not before it was amended to delete the automatic driver’s license suspension it originally called for. As it’s written now, the bill would raise fines and add a point against a driver’s record if the driver is convicted of causing bodily injury to a vulnerable road user, including bicyclists and pedestrians. The bill passed the Assembly 72-2. Developing a mileage-based user fee to pay for roads: S.B. 1077 from Mark DeSaulnier (D-Concord) would require CalSTA, the California State Transportation Agency, to develop a replacement for the gas tax by finding a way to charge road users based on how many miles a vehicle is driven. The aim is for a “price signal” to encourage people to drive less, thus reducing emissions and traffic congestion. Plus, a mileage-based fee would be a more stable source of funds than the gas tax, which is dwindling due to increasingly fuel-efficient cars, electric vehicles, and politicians’ unwillingness to use the word “tax.” The bill passed the Senate on a mostly party line vote (23-11) and now goes to the Assembly. Funding bike paths with a vehicle registration fee: S.B. 1183, also from Mark DeSaulnier (D-Concord), passed the Senate 26 to 9. This bill started out as a sales tax on bicycles to fund bike path maintenance, but opposition to a new tax, and the complexities of managing it, caused the authors to re-think their approach. As it’s written now, the bill would allow local jurisdictions — cities, counties, and park districts — to put a vehicle registration fee increase of $5 or less to pay for bike path maintenance on the ballot. Local voters would have to approve the fee by a two-thirds vote. Replacing old polluting vehicles with a range of options: S.B. 1275, from Kevin De Leon (D-Los Angeles), would expand options under the state’s compensation program intended to create an incentive for owners to ditch heavily-polluting vehicles. The bill would increase compensation for low-income program participants, and provide the option to use the incentive for a transit pass or car-share membership rather than spending it to buy another vehicle. The bill passed the Senate on a 27-to-9 vote. For social media coverage focused on state-wide issues, follow Melanie @currymel on Twitter or like our Facebook page here. Email tips, alerts, press releases, ideas, etc. to melanie@streetsblog.org. A bill to create a statewide youth transit pass program passed the Assembly Transportation Committee, as did one that would require that at least one member of the California Transportation Commission represent low-income communities. Another bill, to create a pilot program to use automated speed enforcement cameras in San Francisco and San Jose, was put off for a year.